Come With Lights and Music. Lanterns all aglow, presents beautifully wrapped, people gathered for festive parties and, of course, Santa Claus - these beloved traditions make our holidays the happiest. Now, this Winter Elegance Personalized Sculpture captures the spirit of these nostalgic traditions in a first-ever exclusively from The Bradford Exchange. Best of all, this limited-edition Santa Claus sculpture is personalized with up to 6 names featured in Santa's gift sack for a festive one-of-a-kind statement bound to make quite an impression in your holiday home. Grandly sized at three feet high, the Winter Elegance Santa Claus sculpture is masterfully handcrafted of artist's resin and meticulously hand-painted to bring Santa's irrepressible face to life. His hand-sewn outfit is strikingly beautiful, with white velvet and furry white trim, graced with golden and silver accents and icy-crystal faux gems. One of the jolly fellow's hands holds a golden lantern that really glows, while his other hand holds the bag of personalized gifts. And best of all, at the touch of a switch, Santa plays a heartwarming medley of 8 holiday carols. Strong demand is expected for this Christmas masterpiece, sure to become the focal point of your holiday decorating. Don't miss this opportunity. Order now! The glorious stories about the miracles Jesus Christ performed while walking on Earth continue to be an inspiration to all believers - ever strengthening our faith, instilling us with hope and demonstrating the amazing power that His love provides. Now, these incredible biblical stories come to life as never before in the Thomas Kinkade Miracles of Christ Sculpture Collection, limited editions exclusively from The Bradford Exchange. Your collection begins with Issue One, All Things Are Possible. Soon your collection will continue with Issue Two, I Am the Life, Issue Three, Transfiguration and additional Thomas Kinkade Jesus sculptures, each a separate issue to follow. Every issue in the collection is exquisitely handcrafted, intricately hand-painted for exceptional realism, and features the Lord performing a miracle. Incorporated into every sculpture is radiant imagery by the renowned Painter of Light™, Thomas Kinkade, along with inspirational words from Scripture. And with the flip of a switch, the sculpture illuminates from within, casting a heavenly glow. Each sculpture is presented upon a mahogany-finished base. These uplifting sculptures are luminous masterworks that are sure to enrich your faith each time you gaze upon them, and they make meaningful religious gifts, but strong demand is expected. Don't miss this opportunity. Order now! When you're dreaming of a "White Christmas", this magnificent Santa Claus is sure to be the star of the show! Introducing the White Christmas Santa Doll, a first-ever Collector's Edition Santa collectible doll from The Ashton-Drake Galleries. This magical Santa doll by Master Doll Artist Karen Vander Logt is ready to become a cherished part of your holiday celebrations. Elegantly costumed in gold and white, this Santa is more than eager to spread Christmas spirit. Whether you are on Santa's "Nice" or "Naughty" list, this enchanting and charismatic Santa is sure to bring a smile to your face. Standing at a spectacular 25" tall, this Santa with a cloth body is brimming with style in his hand-finished white suit, glistening with gold filigree detailing and cinched with a gold tassel. The centerpiece of this ensemble is the stunning floor-length robe, cleverly lined with more than 40 sparkling, twinkling LED lights in the soft faux fur trim. His regal snow-white beard and hair are hand-applied genuine mohair. Even his bag of toys is cleverly crafted of gold lame and his walking stick decked with gold accents, a swirling ribbon and a festive sprig of garland. Touch the button in back to hear the heartwarming melody of "White Christmas". This exquisite collectible Santa doll will lend both warmth and beauty to your holiday display. Strong demand is expected, so order now! At holiday time, friends and family gather round to revel in the joy, love and splendor of the season, just as kings and shepherds gathered at the Nativity. Now bring home a charming imagining of the blessed Nativity with the Precious Moments® Holy Family Nesting Figurine Set, a first-ever exclusively from The Hamilton Collection. This Precious Moments collectible features three Nativity figurines, beautifully handcrafted in artist's resin and hand-painted, that can be displayed separately or nested together. Each beautiful figurine in this 3-in-1 set helps weave the miracle-filled tale. There's the baby Jesus laying in his bed of "straw", Mary and Joseph standing lovingly over him, and the glorious Christmas angel with her glistening golden halo, glittery wings and twinkling crystalline star that let the world know the King had arrived. And when displayed side by side, you'll delight at the etched, bas-relief details of the figurines' interiors, which capture iconic moments like the arrival of the wise men and a tender silhouette of the Holy Family. Plus, look closely and you'll see the night skies are aglow with sparkling genuine Swarovski® crystal "stars"! Strong demand is anticipated for this limited-edition nesting figurine set, so don't wait. Order now! Christmas Eve might have started with visions of sugar plums, but it ended in a magical way this precious girl never could have imagined - on the lap of Santa as he reads her "'Twas the Night Before Christmas". Now, celebrate this joyous moment with the 'Twas The Night Before Christmas Portrait Doll Set, a two-doll Collector's Edition Set by artist Karen Vander Logt, renowned for her heirloom-quality Santa dolls. An Ashton-Drake Galleries exclusive, this charming Santa doll set actually plays the beloved poem "Twas the Night Before Christmas" with a push of the button. Both poseable dolls in this Santa portrait doll set are handcrafted in soft vinyl and hand-painted to capture every realistic detail. Drawing inspiration from the poem, Santa has a twinkle in his eye, rosy cheeks, and a soft beard as white as snow. His custom-tailored suit of red velveteen has plush faux fur trim and a golden jingle bell at the tip of his hat. Plus, his biggest fan is nestled under his arm as the two sit on a mahogany-finished wooden rocking chair. Santa's sweet friend is dressed in classic candy-cane-striped Christmas pajamas, her pigtails gathered up in matching red ribbons. These adorable Christmas dolls are sure to become a featured part of your holiday decor. Strong demand is expected, so order now! Fine adult collectible, not intended for children under 14. What better way to celebrate the miracle of the First Christmas than with a Nativity display? Now, the timeless beauty of traditional Polish stoneware inspires this first-ever Silent Night Nativity Set, available exclusively from The Bradford Exchange, Hawthorne Village Division. The heirloom-quality collectible Nativity figurines in this set include Mary and Baby Jesus, Joseph, and the Three Kings, creating a graceful and elegant tribute to that glorious night. Graced with the lavish peacock feather-inspired patterns and vibrant colors that make Polish stoneware pottery so highly valued, this exquisite set of Nativity figurines comes together to create a unique celebration of faith. Each fully sculpted figurine is individually handcrafted and hand-painted by highly skilled artisans in meticulous detail. Heavy demand is expected for this magnificent Silent Night Nativity Set, so don't wait. Order now! Lanterns aglow with welcoming light. Presents wrapped with care. Families gathered to tell tales of Christmases long ago, and of course... Santa Claus! Beloved traditions like these make our holidays the happiest occasions. Now capture the spirit of the holiday season with the Thomas Kinkade Delivering Holiday Cheer Personalized Sculpture, a MARKET FIRST limited edition exclusively from The Bradford Exchange. This illuminated personalized Santa sculpture inspired by the nostalgic holiday visions of Thomas Kinkade can even be personalized with up to 6 names featured on Santa's gift sack for a truly personal holiday heirloom. Standing at an impressive three feet high, this merry Santa sculpture is handcrafted in artist's resin and meticulously hand-painted. Delightfully lifelike with twinkling eyes, cheerfully rosy cheeks and fluffy whiskers, he wears a velvety red outfit with furry white trim, golden accents and shiny black boots. One hand holds an illuminated lantern in signature Thomas Kinkade style, while his other hand holds the bag of presents which can be personalized with the names of you and your loved ones on the Nice List. And best of all, at the flip of a switch, your personalized Christmas sculpture plays a classic reciting of "The Night Before Christmas" from Thomas Kinkade. The ideal complement to any room, hearth side, Christmas tree or welcoming entry, strong demand is expected for this festive sculpture. Don't hesitate, order now! In the arctic wilderness of the North Pole, beneath the glow of a full moon, a rare sight appears in the distance. Instead of reindeer, a pack of majestic wild wolves lead Santa on his journey. Now, you can celebrate this thrilling sight with a first-ever Santa sculpture showcasing alluring wolf art by Al Agnew. This limited-edition Christmas illuminated sculpture is available only from The Bradford Exchange. Expertly handcrafted in artist's resin and lavishly hand-painted, this stunning Christmas wolf art Santa sculpture portrays Santa being pulled in his sleigh by a determined pack of wolves. Santa's windswept robe and warmhearted expression to the powerful stance of each wolf add realism while Al Agnew's striking wildlife scenes adorn Santa's cloak and sleigh. The hand-carved look of the snowy base, wood-grain texture of the sleigh and soft faux-leather reins add extra delight. Plus, Santa's lantern and sleigh light up within bringing Al Agnew's wolf art to life and makes a unique addition to your Christmas decoration! Strong demand is expected. Order now! On Christmas Eve, when it's ALMOST Christmas, Santa Claus is at his busiest, but he'll always take time to check his Naughty or Nice list. Now, inspired by the artistry of Thomas Kinkade, this heartwarming Christmas sculpture captures Santa as he prepares for the big night, creating a holiday treasure filled with lights, motion, and music! 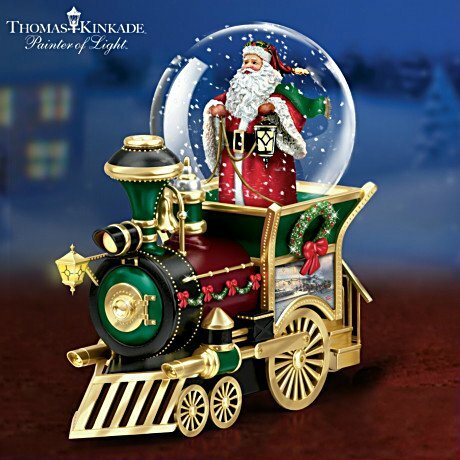 Presenting the Thomas Kinkade Almost Christmas Sculpture, a spectacular limited-edition first ever exclusively from The Bradford Exchange. This premiere masterwork is sure to become a treasured holiday heirloom, passed along from generation to generation! Individually hand-cast in artist's resin and hand-painted in exquisite detail. Santa stands by his richly adorned sleigh, petting a gentle reindeer as he gives his Special List one more look. His bag, overflowing with toys, sits in the back of the sleigh. But take another look at the sleigh - it holds a fascinating treat: a miniature illuminated Thomas Kinkade village with a moving sleigh, "flying" high above the beautiful snow-covered sculpture scene as a medley of eight classic holiday melodies fills the air! Don't wait to make this magical heirloom-quality Thomas Kinkade Santa sculpture yours; intense demand is expected. Order now! On a magical winter's night, everyone has gathered around to share in a most special time. As the happy folks of the village celebrate the upcoming time of joy, the winter birds of the woodland add their merry greetings to the yuletide festivities. Now you can enjoy this heartwarming moment with the Thomas Kinkade Winter Wonderland Snowglobe, available in a limited edition exclusively from The Bradford Exchange. This hand-painted snowglobe brings the sights and sounds of the season to life with lights, music and continuously swirling snow! Topped by a cardinal on a sprig of holly and fresh "snow", the crystal-clear globe illuminates from within at the touch of a switch, giving the fully sculpted Thomas Kinkade Victorian home inside the welcoming look of a house ready for holiday company - or a visit from Santa! But it's the swirling snow that makes this scene especially festive. A built-in water pump keeps the flurries flying at the touch of a switch. This gleaming snowglobe rests on a sculpted, snow-dusted hillside with a forest scene on one side that's a home for a flock of winter feathered friends. Across the way, a happy family sings carol after carol as others decorate the tree. Both the decorated tree and the pines in the forest glow with beautiful illumination. The lights on the tree actually change color as a medley of 8 holiday carols plays. A wood-toned base bears a golden title plaque, and a built-in timer turns the lights on and off at the same time each night. Strong demand is expected for this Thomas Kinkade holiday decor, so don't delay. Order now! There is nothing as delightful as witnessing the joyous sights of Christmas blanketed in winter's shimmering frost. And no other artist has captured the classic charm of this season like Thomas Kinkade. Now, one of his most treasured holiday images is presented on this Thomas Kinkade Warm Winter's Glow Sculpture, an exclusive first-ever from The Bradford Exchange. This enchanting illuminated glass snowman lights up from within to highlight a special design innovation that lends the frosted wonder of winter to the scene - it's as if the shimmering snowy effect Thomas kinkade created has been extended out onto the glass snowman! Expertly handcrafted of radiant glass with a unique frosted effect and artist's resin, this Thomas Kinkade snowman sculpture serves as the perfect showcase for one of Thomas Kinkade's most beloved images of a grand Victorian home decorated for the holiday season. This jolly fellow conveys the charm of a classic snowman with a welcoming smile, carrot nose and "knit" scarves and mittens, which are richly lavished with a silvery finish that glistens in natural light. A decorated tree on his outstretched arm has enticed a colorful cardinal to join in the fun, each detail of the bird's distinctive beauty is intricately hand-painted. A genuine Swarovski® crystal on the snowman's snowflake-tipped hat serves as the perfect finishing touch. Makes a striking addition to your holiday decoration plans. Strong demand is expected, so order now! A devoted family of cardinals nestles amidst the snow-tipped boughs of an evergreen tree, their bright crimson feathers a welcome splash of color that brightens your day. Their cheerful faces and loving gazes remind us that the merriest moments of the season are those that are spent together. And no other artist has captured the cardinal's cheerful beauty more delightfully than the famed Joseph Hautman, four-time winner of the Federal Duck Stamp Competition and a pre-eminent master on the wildlife art market. Now, you can celebrate his striking work in the first-ever Winter's Beautiful Blessings Tabletop Tree, a grandly-sized masterpiece of lights, art, and sculpture to brighten your home during the holiday, exclusively from The Bradford Exchange. This natural-looking lighted faux evergreen pine Christmas tree is decorated with four hand-cast and hand-painted cardinal sculptures that have been custom-designed to recreate the splendor of award-winning artist Joseph Hautman's imagery. Clusters of red berries, sculpted pinecones and festive green branches blanketed with a glistening layer of "snow" add extra holiday cheer. Plus, more than 30 LED lights add a merry glow to this charming tree while a 5-hour timer allows you to set what time of day you'd like your tree to come alive with light. For the perfect finishing touch, this delightful tree sits in a stunning base finished in rich porcelain tones and decorated with two darling cardinals from Joseph Hautman's art. Strong demand is expected, so order now! As the iconic song from Disney's "The Lion King" explains, the term "Hakuna Matata" means "no worries!". Now celebrate that carefree spirit of the Pride Lands every minute with the Disney The Lion King Hakuna Matata Wall Clock, licensed from Disney and available from The Bradford Exchange. Superbly handcrafted with amazing detail and hand-painted by master artisans, this Lion King wall clock features a savannah sky that lights up and changes from daytime to nighttime! This day-to-night sculptural wall clock features beloved characters from the animated film including Simba, Timon, Pumbaa, Nala, Scar, Zazu and Rafiki surrounding the illuminated sky clock face. The hyenas hang from "vines" below the clock. Plus, this Disney clock plays iconic music on the hour, making it an unforgettable addition to your Disney home decor. It is available in a limited edition of 295 casting days and strong demand is expected, so don't wait! Order now! It's time for a merry visit to Thomas Kinkade's North Pole Village! Inspired by the warm nostalgia found in Thomas Kinkade's beloved Victorian art and available only from The Bradford Exchange, Hawthorne Village Division, the Thomas Kinkade North Pole Village Collection is the perfect place to enjoy a good old-fashioned happy holiday, starting with Issue One, Santa's Workshop with FREE ELF Delivery Figurine Set. Next to arrive will be Issue Two, Reindeer Stables with FREE Pulling at the Reins Figurine Set. Soon your collection will continue with Issue Three and additional Thomas Kinkade North Pole Village sculptures, each a separate issue, including one more free figurines sets, will follow. Welcome to the kind of North Pole village that only the Painter of Light™ could have imagined! In fact, many of the buildings in this North Pole Christmas village collection are re-imagined from some of your favorite Thomas Kinkade artworks. Each building and figurine is individually handcrafted in beautifully detailed artist's resin, and fabulously hand-painted with the most delicate of brushes in a multitude of bright Christmas hues. These hand-assembled, merrily decorated buildings are illuminated from within, filling the North Pole Square and the long Arctic night with inviting light. And the three FREE figurine sets, a $45 value, with your collection, bringing this heirloom quality North Pole Village to life and help set the jolly scene you and your family are sure to visit and re-visit for years to come. But strong demand is expected so don't delay. Order now! With his red nose shining bright, this adorable little Dachshund is ready to guide Santa's sleigh on Christmas Eve. Inspired by the classic televised holiday special "Rudolph the Red-Nosed Reindeer®", which has won the hearts of young and old alike for over 50 years, you can let this endearing Dachshund figurine brighten your holiday season year after year. Introducing the Dachshund Through the Snow Figurine, available in a limited edition exclusively from The Hamilton Collection. From the top of his antlers to the tip of his red nose, every nuance of this Dachshund figurine is handcrafted with lovable detail. Inspired by the holiday favorite and dressed like Rudolph®, this Dachshund even wears an adorable "jingle" bells harness and comes with a very special friend, a Santa doll. Hand-painted in a rich glossy hue, this darling doxie will bring plenty of Christmas cheer to your holiday season. Tremendous demand is expected, so don't delay. Order now! For over three decades the television classic Rudolph the Red-Nosed Reindeer® has captured our hearts. Now, relive those cherished memories when Rudolph's® Christmas Town village collection comes alive right in your own home, starting with Issue One featuring Santa & Mrs. Claus' Castle and FREE Rudolph & Clarice figurine. Before long you'll be lining up for training at Issue Two, Coach Comet's Flight Camp, which includes a FREE Santa and Mrs. Claus figurine. Additional village buildings, each a separate issue and some with select free figurines and accessories, will follow. All the handcrafted and hand-painted Rudolph Christmas Town village buildings light up, casting a warm holiday glow on your beloved friends, Rudolph and Clarice, Santa and Mrs. Claus, the lovable Hermey, Bumble and more! This magical village collection is an exclusive collectible first from the Bradford Exchange, Hawthorne Village Division and a great value you don't want to miss, so hurry! Strong demand is expected - order now! Of all the season's gifts, the sparkle of fresh fallen snow is perhaps the most enchanting. Add wintry wonder to your Christmas decor with a collectible Thomas Kinkade Santa Claus figurine, a first-ever Bradford Exchange exclusive to showcase holiday songs, a moving Santa Claus, gleaming LED lights and unique laser-cut snowflakes.Be charmed by the vision of the Painter of Light™ Santa with this limited-edition Thomas Kinkade tabletop Santa figurine. 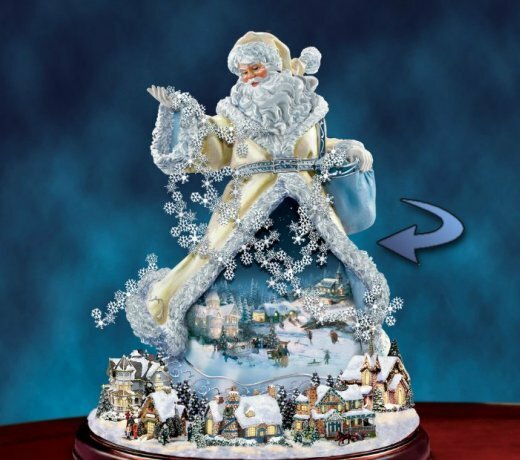 Dressed in resplendent winter white, the handcrafted Santa Claus figurine rotates in circular motion to "sprinkle" an array of silvery snowflakes on the village below. Inspired by Mr. Kinkade's beloved holiday artwork, the village features 8 hand-painted buildings, a horse-drawn carriage, villagers and more. At the flip of a switch, the rosy-cheeked Santa merrily rotates and 16 LED lights glow within the village buildings and illuminate Mr. Kinkade's artwork. Plus, you'll hear a medley of 8 classic holiday songs. Glitter-touched snow adorns Santa's robe and the village atop the handsome wooden base. This Christmas wish come true from America's most collected living artist is expected to generate exceptional demand. Don't delay - order now! Quick as "Bibbidi-Bobbidi-Boo", Cinderella won the Prince's heart - and ours! Now, in a Bradford Exchange Collectibles Market First, Cinderella's magically enchanted ballgown becomes a 3-D porcelain collectible bell, revealing Disney art inspired by the cherished screen classic! You'll treasure the rich, romantic elegance of this lovely Disney Cinderella figurine, hand-sculpted of lustrous, triple-fired Heirloom Porcelain® and 22K-gold accents. Careful crafting and fidelity of detail reflect Cinderella's beauty just as you remember. Hear it ring with a delicate chime! Strong demand is expected for this for Disney Cinderella collectible. Order now!